Caught again and this time, his captors take a piece of his foot to keep him from running away. His dreams are mixed and messy, filled with horror and love. 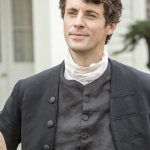 He finally comes out of it, to Belle (Emayatzy Corinealdi) taking care of him, and Fiddler calling him his warrior-son – Doc Waller (Matthew Goode) took him as down payment for what his brother owed him. He was being “ornery” at the help, but he came around. Fiddler set it up so the doctor would notice his horse skills, and it worked. Belle keeps running up to save him from the cruelty of yet another. One year later (1783): Toby is the driver, even for clandestine meetings between the Doc and his sister-in-law. The baby named Noah is born, but the mother dies. 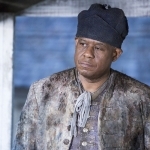 Kunta Kinte opens his heart to Belle in the most endearing way, and asks her to be his wife. They are married, but Kunta is called away because the sister-in-law had a baby, Missy. Doc Waller smacks Kunta for saying something innocent but shows his guilt. Belle is pregnant. It will be her 3rd and Kunta is her 2nd husband. They were all sold. Kunta will protect them. This night had me in tears and made me smile. The juxtaposition of Kunta and his father at the moment of their child’s birth is gorgeous. They go to name the baby. No!!! 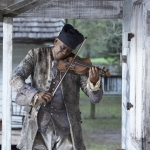 Fiddler saves Kunta Kinte by sacrificing himself, so Toby and baby Kizzy should live. Six years later (1789): Kizzy and Missy are little friends. They play and come upon a religious group who says slavery is evil. Missy wants to teach Kizzy to read in secret. Everyone is against them. 9 years after that in 1798, the girls are still wonderful friends. Doc Waller said it’s almost time to breed her with Noah. Her father starts teaching her how to ride a horse and to survive, in case she has to escape. Noah wants her to teach him how to read. The horror of the last 20 minutes is unbelievable. Noah is riddled with bullets for running away. Kizzy is taken away for learning to read and Missy screams at her and says it’s all her fault. She tries to escape but is recaptured. And in walks Tom Lea (Jonathan Rhys Myers), who rapes her as “his right.” Kizzy has a baby and names him as she was named and Kunta was named before her. The series does a good job of making you feel the hopelessness and despair of the slaves (as much as you can just watching it on a screen). There were some fleeting moments of happiness for this family, which felt all the more sweeter for its surroundings. Night 2 was even more powerful than the 1st night. And it could be because the plight of the slave women resonated more with me. No matter how kind the kindest master was, they were all still evil. Doc Waller was worse because he cloaked his evil in civility, so when it came out, it was even worse than the white man who was honest about his brutality. 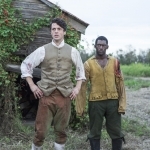 Roots: Night 3 airs tomorrow night at 9:00pm on A&E, Lifetime, and The History Channel.